George M. Cohan (1878-1942) rose to the top of his profession as a performer, songwriter, playwright, director, and producer. And this year, the 13th Street Repertory Theater’s “George M. Cohan Song-and Dance Award”–honoring multi-talented performers –has been presented to Michael Czyz and Rayna Hirt. Ross added: “I am always thrilled to see any interest in George M. after all of these years, considering all that he and my other family members have historically contributed to the arts.” Her great-grandfather, George M. Cohan, was known in his day as “The Man Who Owns Broadway,” and his statue stands on Broadway (at 46th Street) today; her great-grandmother, Agnes Mary Nolan Cohan, was an actress; her grandmother, composer/lyricist Mary Cohan, collaborated on the Broadway musical “George M!” And Edith O’Hara noted proudly one link that her own family has to the Cohan family; when “George M!” opened on Broadway, back in 1968, it was Edith’s daughter Jill O’Hara who portrayed Cohan’s second wife–Jennifer’s great-grandmother–Agnes Mary Nolan Cohan. She sang Cohan’s song “Billie” in the show–and still sings it occasionally in her appearances today. In 2014, Michael Czyz co-starred in two shows at the 13th Street Rep. Chip Deffaa’s high-energy “Irving Berlin Ragtime Revue” drew packed houses throughout its run in its world-premiere engagement. It proved such a hit that a cast album (to be released by Original Cast Records) is now in the works. And–to the happy surprise of co-producers Edith O’Hara and Sandra Nordgren–“Theater Boys” was the most successful gay-themed musical to play at the historic 13th Street Theater since the trail-blazing “Boy Meets Boy,” 40 years earlier. The theater intends to bring both “Theater Boys” and “The Irving Berlin Ragtime Revue” back for return engagements. Award-winner Rayna Hirt not only co-starred in “The Irving Berlin Ragtime Revue,” she helped choreograph it. Czyz recalls: “I’d put on my mom’s fur coat, pretend to smoke a cigarette, and act out the role of Cruella DeVille.” He may well have been the best five-year-old Cruella deVille his mom had ever seen. By the time he was 11, Michael Czyz–the son of Polish immigrants, growing up in Calgary, Canada, and small for his age–was starring in his school’s production of “The Mikado.” His high school had posters of various institutions of higher education–including one for the venerable American Academy of Dramatic Arts, showing photos of famed graduates. He auditioned for the Academy, was accepted, and moved to New York City–a young man who knew no one in the big city. And Michael Townsend Wright praised Hirt’s commitment and talent as a performer. 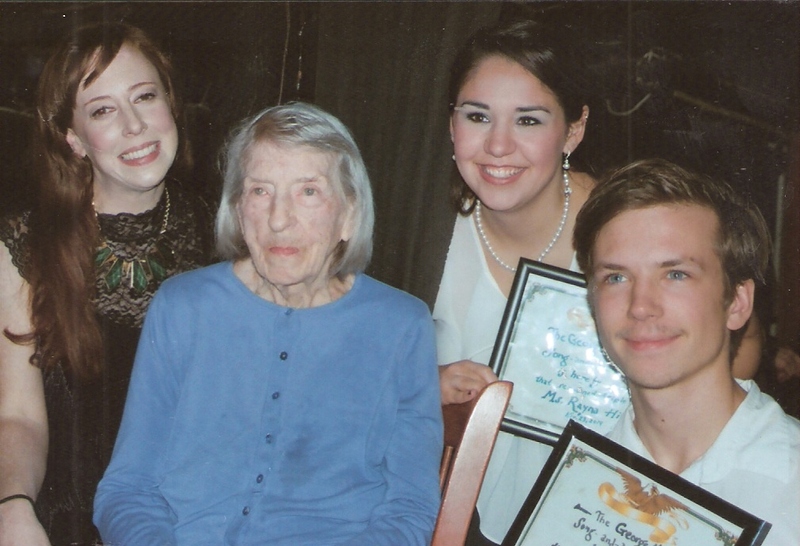 According to Edith O’Hara, the longtime head of the 13th Street Repertory Company, the theater’s mission has always been to nurture and encourage young performers, and the Cohan award is in line with that tradition. O’Hara recalls proudly that many accomplished performers have worked at the theater, early in their careers–including Bette Midler, Chazz Palminteri, Christopher Meloni, Giuseppe Bausilio, Amy Stiller, Barry Manilow. She’s all for encouraging new talent. And for the theater company, having a member of the Cohan family on hand to present the Cohan Award, symbolizes the passing down of high standards from one generation to the next. The award is, along with the “Betty Buckley Award,” presented last month to young artist-to-watch Emily Bordonaro, is a major award at the theater company. Robert Creighton is sensational in this affectionate and quaint biographical musical chronicling the icon’s rise from vaudeville to Hollywood stardom. At the awards presentation, Deffaa noted he’s worked with Bordonaro (whom he praised as being “as talented as any young actress I’ve ever worked with”) on various projects since she was 11.